Ted continues to tell his kids the story of how he met their mother. However, by this point, they've become frustrated at the whole story taking too long, and try to ask him to skip ahead to their mother's meeting, as "I feel like you've been talking for, like, a year." Ted and Robin are now a couple; meanwhile, a heartbroken Marshall tries to continue his life without Lily. After enduring numerous emotional breakdowns, Marshall's friends step in, and Barney, using sly catch phrases and pick up lines, tries to get Marshall back in the dating game. Later, Lily, after finally realizing she is not meant to be an artist, returns to New York. She is reunited with Marshall, and the end of the season culminates in their marriage. When everyone discovers Robin was a Canadian teen pop star known as Robin Sparkles in the early 90s, with a hit single "Let's Go To The Mall," Marshall and Barney create a bet on whether Robin was involved in "adult films." When Barney discovers that he is wrong, the popular "slap bet" is created which permits Marshall to slap Barney in the face 5 times as hard as he can at any given time in the future, whenever Marshall chooses, which he does twice during this season. It is revealed that Barney has a gay, black brother and that he believes that Bob Barker is his father, unaware that his mother lied to him, and takes a trip to California to be a contestant on The Price is Right to meet his "father." 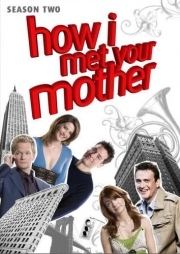 In the season finale, Ted reveals to Barney that he and Robin have been broken up for some time due to their conflicting views on marriage and kids. They didn't tell anyone in order to avoid taking attention away from Lily and Marshall's wedding. The season ends with Barney excited at the prospect of Ted and himself being single guys on the town again, and ends the season with Barney saying, "This is going to be legen- wait for it..."
# 1 - Where Were We? Whole or part of the information contained in this card come from the Wikipedia article "How I Met Your Mother (season 2)", licensed under CC-BY-SA full list of contributors here.